Over the years, Pinterest has evolved from a simple product discovery and scrapbooking site into a powerful personalized search platform. Since launching Guided Search back in April, search volume per user has increased by 25 percent. Personalized search provides big opportunities for content, but it also challenges brands to Pin more strategically in order to reach target audiences. The key to getting your Pinterest Pins in front of more people is understanding how people explore Pins to begin with. Therefore, let’s dive deeper into user behavior and explore other ways you can leverage Pinterest’s feature set to achieve your business goals. Researchers at Pinterest have begun to understand why and how people Pin. So far, these reasons can be summarized into four different mindsets. Understanding and developing a strategy around them can help you figure out which type of Pins to add in order to reach your goals. This person is browsing Pinterest without a particular goal in mind. It’s an undefined need for someday in the future. They might be thinking that they’re interested in travel and healthy eating, or they could just be wondering what Pinterest has to show them today. Either way, they’re looking to be inspired and it could be your Pin that does just that. This person might not know exactly what they’re looking for, but they know they’ll need to figure it out soon. Here the need isn’t very defined, but the timeframe is much sooner than in the previous two mindsets. The Pinner here knows exactly what they’re looking for and they need it right away. They have both a defined need and short timeframe. As Pinterest has pointed out, these mindsets mirror the customer journey. “People start looking, get inspired, narrow down their options and then make a decision,” explained Larkin Brown, a researcher at Pinterest. Armed with that knowledge, businesses can add all kinds of Pins to help consumers every step of the way. Search is an important way for Pinners to find content from your business. One of the best things you can do to improve this process is to sharpen your Pin descriptions. Think about what people who are looking at a certain Pin might have searched for, and mention the most compelling and distinct parts of the Pin in your description. However, it’s important that you’re captivating Pinners and not just dropping in keywords. Carefully craft your Pin descriptions to make them aspirational as well as actionable. It’s also important to include thoughtful descriptions on the content people Pin from your website. Better Reporting: To help advertisers better understand how Promoted Pins are performing, Pinterest will begin communicating how often your ads are shown or how many people bought a product after clicking on your ad. 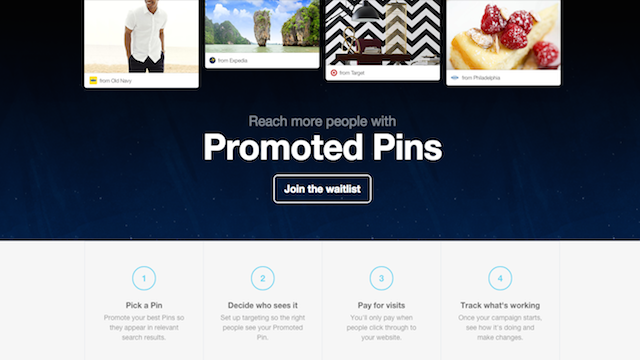 Relevant Targeting: Promoted Pins will be more relevant and displayed from brands that members have shown interest in. The company currently uses recently visited websites and information from its ad partners to display more relevant Promoted Pins and recommendations. Pinterest has traditionally been a female dominated platform; however, that trend seems to be shifting as the platform grows. According to the company’s head of engineering Michael Lopp, the service has doubled the number of male active users in the past year. In fact, men now make up one-third of all new Pinterest sign-ups, and the growth rate for men is higher than for women. If you’re promoting a Pin, you’ll be asked to pick at least one keyword to reach people in search results. Keep in mind that people use Pinterest differently than other search engines, so it’s helpful to consider the phrases commonly used on the platform. From there, you’ll be asked to refine your audience based on gender, location (currently limited to the U.S.), language, and device. It’s worth noting that 75 percent of all of Pinterest’s traffic comes from mobile. Even if you’re not promoting a Pin, you’ll want to keep a close eye on your Pinterest Analytics for more information about the people who interact with your Pins — both from your profile and your domain. Knowing where your audience is from, what language they speak, and what gender they identify with can help you target your content better as well as figure out new marketing opportunities.